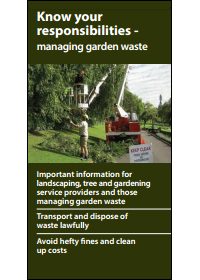 This information is for landscaping contractors, tree and gardening service providers and those managing garden organics waste. What is 'garden organics waste'? Garden organics waste includes materials such as mulch, branches and lopped material, lawn clippings, tree trunks and stumps, leaves and unwanted plants. Uncovered loads of garden organics waste can spill onto the road and create a hazard for other road users. Leaves, branches and mulch from uncovered vehicles can also wash into stormwater drains and pollute waterways. Ensure that garden organics waste transported by a vehicle is covered, or risk a $750 fine. Both the owner of the waste and the transporter are legally responsible for proving that waste was transported to a lawful place. Check beforehand that the waste facility can legally accept your garden organics waste. Consider re-using garden organics waste. For example, you may be able to shred it to produce raw mulch. If you are re-using garden organics waste, make sure that your have the landowner's permission before applying it to their land. If someone is transporting garden organics waste on your behalf, make sure you keep records such as who transported the waste (company name, ABN, vehicle registration and driver details, date and time of transport, description of waste); where the waste was transported to (name and address of the contact person and place); and copies of dockets/receipts for disposal of the waste (date and time of delivery, description of waste). What are the real costs of illegally dumping garden organics waste? Environmental costs: Illegal dumping destroys native bushland and animal habitats by introducing disease, weeds and pests. It also increases the risk of bushfires. Social costs: Illegal dumping attracts more illegal dumping and other criminal activities, decreases community pride and discourages people from visiting affected areas. Financial costs: Illegal dumping costs local and state governments and the community more than $10 million a year in prevention and clean-up costs. What happens when illegal dumpers get caught? The NSW Environment Protection Authority (EPA), other agencies such as local councils, and Regional Illegal Dumping Squads conduct regular campaigns and surveillance operations which target illegal dumping hot-spots. If you suspect someone is illegally dumping waste, see Reporting illegal dumping or contact Environment Line on 131 555.